Why HELLO, it’s me! The Scab Fairy! Tagline: This is no tooth fairy! Summary: Who’s watching while you sleep? The first time Colin saw the tooth fairy was after he’d lost his first baby tooth. His parents laughed when he told them. They said it must have been his imagination. Kids never really see the tooth fairy. But Colin kept seeing her every time he lost a tooth. And even though it was a little spooky to actually see a fairy, he still kind of liked it and felt pretty special. But now that he’s older, Colin is starting to see other fairies in his room at night. Some of them are pretty scary looking. And they’re starting to take a lot more than baby teeth! Before he knows it, Colin finds himself stuck in a truly grim fairy tale. And he doesn’t have much time to figure out how to escape. This month for Point Horror I’ve planned out a small fairy tale theme for my recaps. 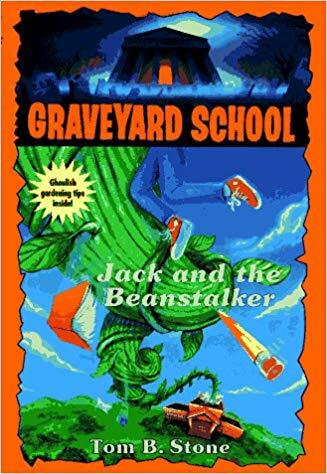 I decided on this months ago when I realized this month’s “Graveyard School” would be “Jack and the Beanstalker.” Well, even though with all the delays I’ve stuck to my decision. I never really get to talk about my interest in fairy tales so I saw this as a fun change of pace and a good way to start the new year. “Faerie Tale” is the last of the Deadtime Stories series and it’s one of the more difficult entries to find. People used to charge ridiculous prices for it on Amazon, but I got lucky last summer and found a cheap copy. Now I’m sure you all remember how awful “Grandpa’s Monster Movies” was, but this book is a delight. 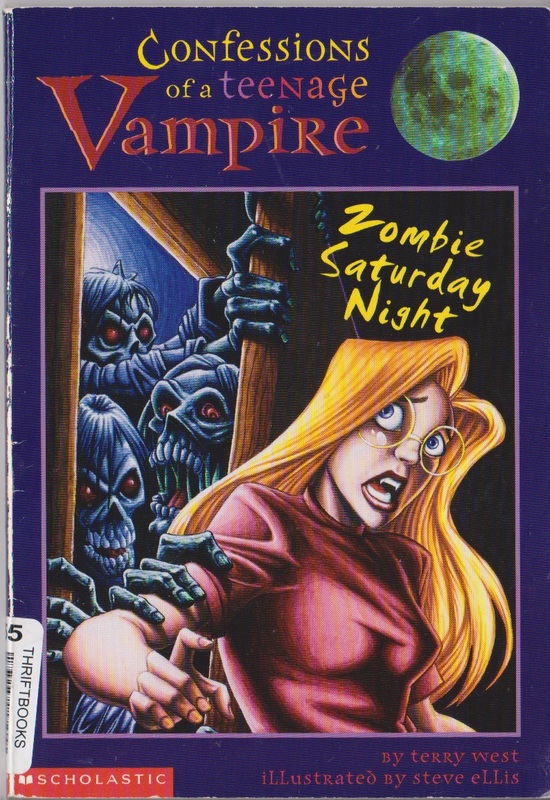 In fact it’s one of the funniest YA horror books I’ve ever read. I’m sure part of that comes from my fascination with fairy tales, yet I won’t spoil all that happens. Suffice to say though, the summaries aren’t exactly truthful over what happens in this book. 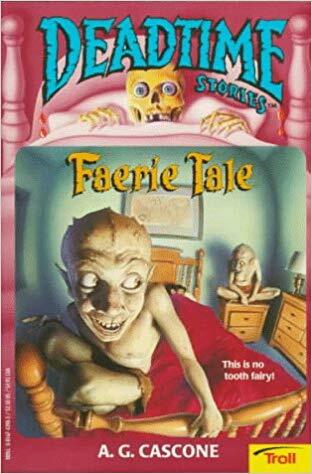 I was always under the impression “Faerie Tale” was about a kid who could see fairies all his life, and as he got older they started to turn more malevolent and creepy looking. That’s not what happens at ALL. Summary: Everyone loves a spooky story. Don’t you? Welcome to a chilling world of hair-raising tales! The thirty stories in this book were gathered from around the world, selected for their ghastly details and terrifying twists. Come inside and meet the young miller’s daughter in “The Robber Bridegroom,” who may have discovered too late that she has been betrothed to a madman; the dancing skeleton who returns from the dead to haunt the friend who betrayed him in life; the Golem, who tires of serving his greedy master and suddenly turns evil; and intriguing characters in stories from the Brothers Grimm, Washington Irving, and other world-famous authors. But before you settle down in your cozy reading chair, check behind you… and keep all the lights on! For my fairy tale theme, what makes a better fit than this collection of international folk tales and ghost stories? 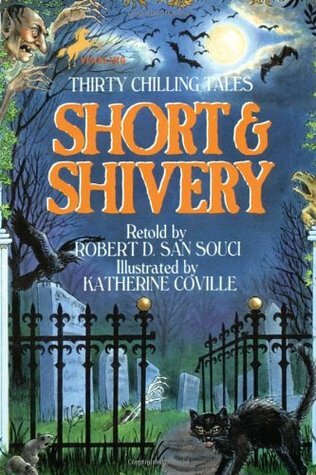 “Short & Shivery” has been a presence in my life since middle school, and I own all four volumes. Many of the stories had something of an impact on my writing, and recently I’ve been attempting to incorporate some of the creatures in these tales in my comic ideas. Now I originally planned to recap all 30 stories in one post, but figuring this would take too long for me to do and for Wing to go through and comment I’ve decided to split it into 3 posts to cover all of the tales. Less frustration and anxiety trying to get it done. Enjoy these first ten tales. Summary: The blankets. The sheets. They were shredded. So I was having a lot of trouble deciding what book to pick for this fairy tale theme I decided on. “Legend of the Lost Legend” involved folk tales, “Beware, the Snowman” a nursery rhyme (sort of), and “A Night In Terror Tower” was about a prince and princess. What made me decide to recap “Full Moon Fever” is because it involves what might be considered a folk tale or a ghost story, it’s another entry most people don’t talk about, I had a commission from a friend I wanted to show off, AND I knew Wing would enjoy more werewolves. Well, they’re sort of werewolves. 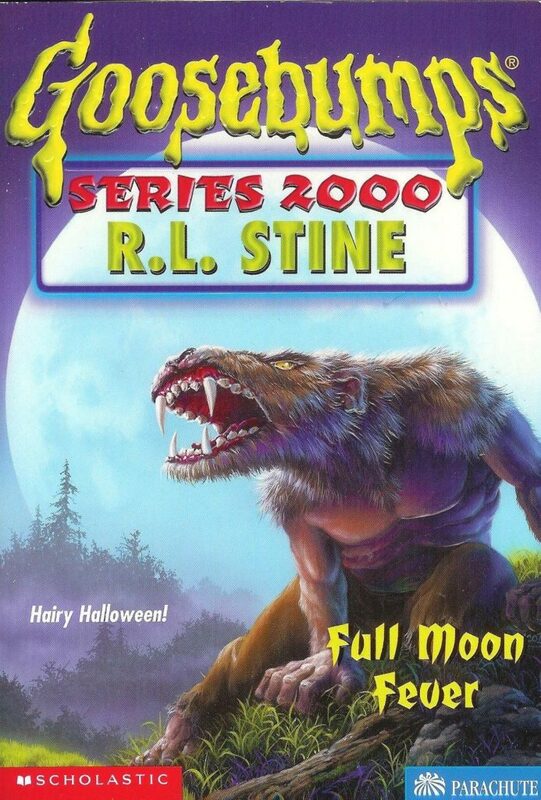 I should mention this book’s reputation of being the worst of the Goosebumps 2000 books, which already doesn’t have a stellar rep. In fact, this is essentially considered a rehash of “Chicken Chicken” which is considered by many to be THE worst Goosebumps book. 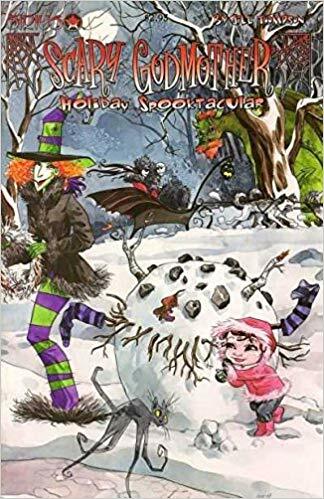 But hey, I went with it because of my seasonal nostalgia for some of the 2000 books, the same reason I recapped “The Werewolf in the Living Room” last year. [Wing: That is the weirdest werewolf illustration I’ve ever seen, so I hope they are only sort of werewolves. That looks more like were … I don’t even know what. Some sort of weremarsupial? Jackson needs to earn some money – fast. When he mows old Mr. Thompson’s lawn, that’s what he thinks he’s going to get. Right? Wrong! Mr. Thompson pays Jackson with magic beans! Now Jackson’s back to square one, and when he throws the beans out the window, his money troubles don’t seem so big after all. Many of us know that money can either be a source of great happiness, or the cause of great trouble. But unfortunately, tonight’s tale shows us that in Jackson Crowder’s case, it’s the latter. Come with me as we see how Jax finds himself in one harrowing situation after another, when something as simple as a broken window grows out of control into a problem of, shall we say, gigantic proportions. Posted in Graveyard School recaps | Tagged adults are helpful, adults are useless, annoying main character, author: tom b stone, comments by wing, graveyard school, recaps by jude, strong bad guy motivation, supernatural oooooh! Skip Wolfson can’t believe he almost missed the bus again! One more late morning and he’ll be in big trouble at Graveyard School. But as he walks down the aisle to find a seat, something tells Skip that he got on the wrong bus. The unbelievably wrong bus. Is it because the driver looks like a skeleton? Or is it that the other passengers seem to have been dug up out of a grave? Skip finds himself wishing for detention instead. Anything but a one-way trip to the terminal of the undead! 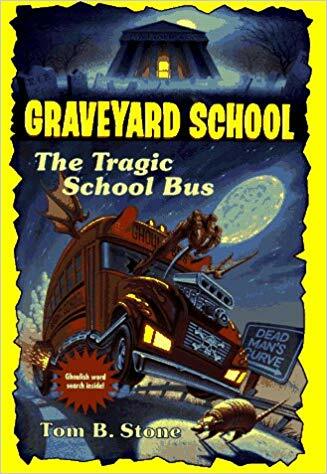 I referenced this book last year in my recap of “Boo Year’s Eve” when Jordie Flanders brings up Skip’s fear of buses. And now has come the day when we learn how that fear started. Not one of my favorite books but I’m sure Wing’s gonna love it because it features the return of Skip Wolfson as the protagonist! And to that end, because this has one of the funniest scenes in the entire series, I’ve prepared a little something extra as a gift to Point Horror. 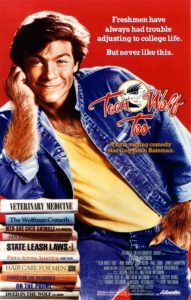 The amazing thing about this book is that it can be viewed as a follow-up to “Little Pet Werewolf” without being a direct sequel. Thacker works in sly nods to Skip’s previous role as the main character without blatantly spoiling the last book. 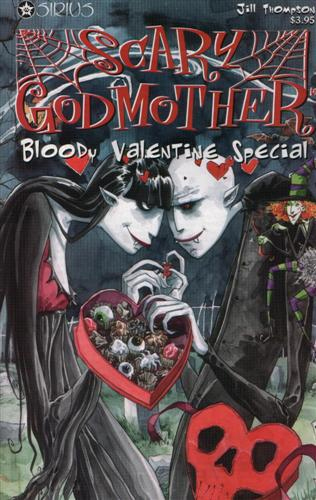 Posted in Graveyard School recaps | Tagged ableism, ACTUAL DEATHS!, ACTUAL WEREWOLVES!, adults are helpful, adults are useless, author: tom b stone, awesome creepy house, awesome lead characters, comments by wing, cool location, obvious red herring is obvious, recaps by jude, strong bad guy motivation, supernatural oooooh! All that money and she couldn’t buy a lock on the door? Summary: My life has really changed since I became a teenage vampire. I can’t stand bright lights and bad smells. I’m so strong I’ve got to be careful not to hurt anyone in gym class. And I’m on a strict diet of Serum V – a special protein product that was invented so vampires don’t have to kill to eat. This past summer I reviewed the first entry in this two book series, and I promised Wing I’d review the second for Halloween this year. Luckily for Wing, it’s got werewolves! Unluckily for the rest of us, while it sheds more light on the vampire mythology of this world, the ending is pretty rushed and there was no third entry. 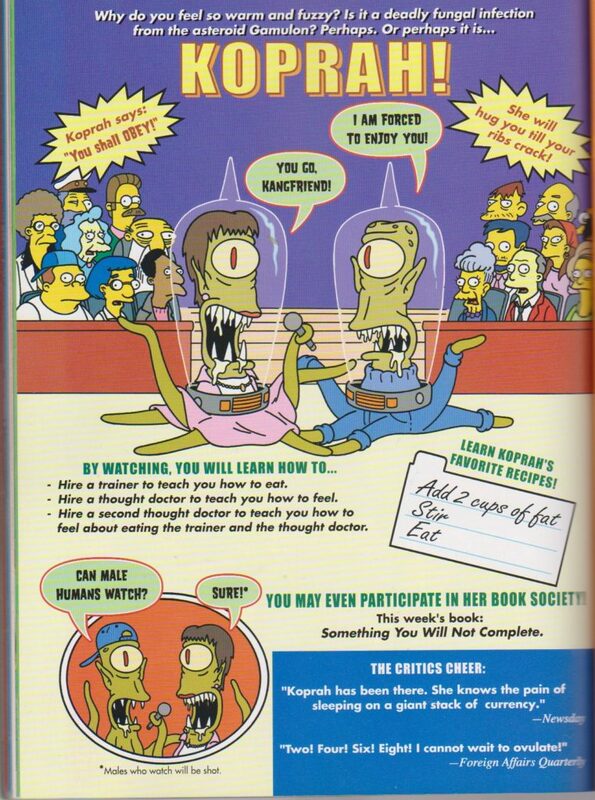 Still, I hope you enjoy this piece of 90s comic cheese as an early Halloween treat instead of a trick. Summary: Prepare for a trilogy of Halloween treats in this year’s terrifying Treehouse of Horror! First, punk rock pixie and Go-Gos founding member Jane Wieldlin (Lady Robotika) leads Marge down the path of the walking dead; then, Zander Cannon and Gene Ha (Top Ten) offer up a remake, Simpsons-style, of the classic horror flick Nosferatu; and finally, indie artist Jim Woodring (Jim) helps Bart uncover the truth behind the biggest mystery in the history of horror comics. 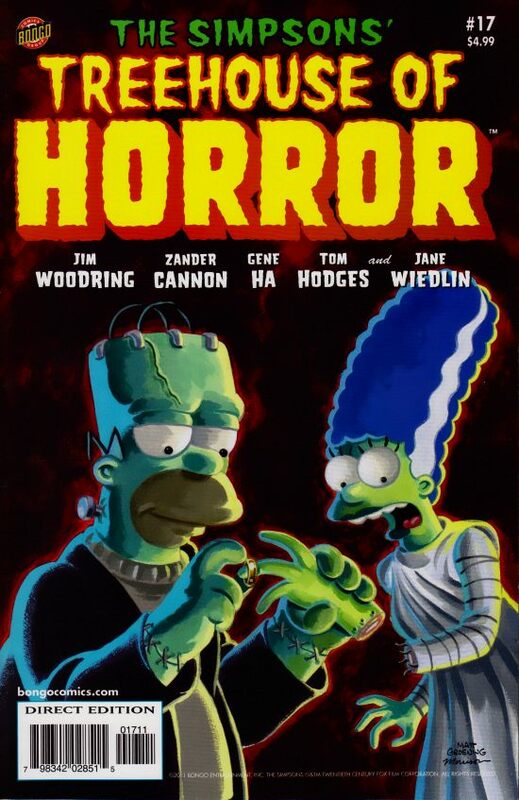 You’ve all heard of “Treehouse of Horror” the annual Halloween themed episodes done yearly on “The Simpsons.” What you probably don’t know is Bongo Comics, alongside the regular Simpsons Comics, releases a “Treehouse of Horror” issue every year. Or at least they did. I wanted to talk about #17 from 2011, an issue I missed when it first came out and tracked down a couple of years ago. 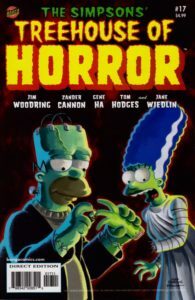 And friends, it’s one of the most legitimately fucked up Halloween-related Simpsons media I’ve seen so far, mainly for its first and last stories.